Excerpt from The Best Diet Book Ever: The Zen of Losing Weight by Dr. Joseph Parent. Pay better attention to what you are doing. Maintain that attention for longer periods of time. Notice more quickly when your attention wanders. Return more sharply to the here and now. 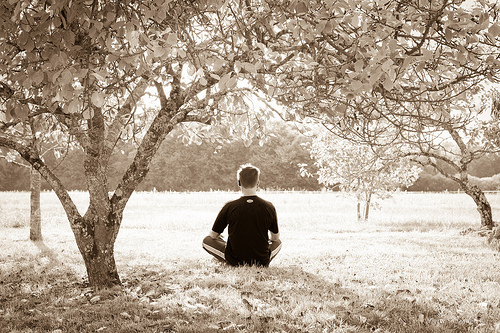 Find a place where you can sit uninterrupted for as long as you intend to practice. For a beginner, it is helpful to find a quiet place, and practice for short periods of time. While this is traditionally done sitting cross-legged on a cushion, most people find it easier to sit on a chair or footstool. If you use a chair, sit in the center of the seat without leaning against the back. It’s helpful to have your knees level with or lower than your hips, to prevent strain on your legs and back. Your feet can be flat on the floor, or loosely crossed in front of you. Let your arms hand straight down from your shoulders. Place your hands palms down, on top of each thigh just behind your knees; or palms up, one upon the other, in your lap. Open your eyes halfway, so that your eyelids block the upper half of your field of vision. Focus your attention only on your posture and the sensation of your breathing, the feeling that your torso is filling with air as you breathe in, and then emptying as you breathe out. When you realize that your mind has wandered into a series of thoughts, just think, “Back to here and now.” Return to focus on your posture and breathing, without judging or criticizing yourself for becoming distracted. Open your eyes fully. Focus your attention on your vision, hearing, and bodily sensations, one after the other. Notice as much as you can, without mental commentary. You will discover that when one sense is in the foreground of your awareness, all the others move to the background. Leave your eyes fully open. As your breath moves out into the space in front of you, be open to the environment around you. Your mind can move to different objects of attention — sights, sounds, smells, sensations, and even thoughts — as long as they are in the here and now. Again, when you realize that your mind has wandered into a series of thoughts, just think, “Back to here and now.” Return to focus on your posture, breathing, and environment, without judging or criticizing yourself for becoming distracted. Continue the practice of opening out and resting in spaciousness with each outbreath. In that way, you can experience thoughts and other sense perceptions clearly and distinctly as they arise. With eyes wide open, looking straight ahead, be aware of the environment around you. With each successive outbreath, expand the scope of your awareness. Imagine that your awareness opens out to the horizon, then to the sky, and then beyond the sky to outer space. finally, imagine that your awareness extends in all directions, farther than the farthest star, and rest in that infinite openness for as long as you can. Traditionally, each session of mindful awareness practice concludes with an aspiration. In our own words, affirm that you will be as mindfully aware as possible throughout the rest of the day or evening. You can also aspire that your practice will benefit both yourself and others.